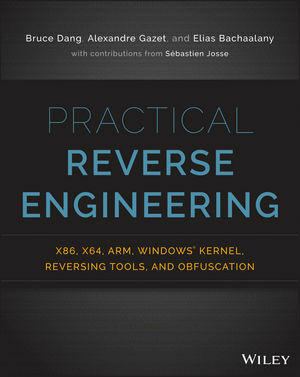 Bruce Dang is a senior security development engineering lead at Microsoft focusing on Windows kernel and reverse engineering. Alexandre Gazet is a senior security researcher at QuarksLab focusing on reverse engineering and software protection. Elias Bachaalany is a software security engineer at Microsoft. The Note in the middle of the page states "Although there are seven debug registers..."
1 5 Text correction: Error under "Syntax"
17 5 Text correction: Error in Assembly code under "Data Movement"
1 6 Text correction: Errors in code under "Pseudo C" in "Data Movement"
"...Importance is set to 0x1 (italicized bits)..."
In the block of code following, the "C6" at the beginning of lines 5 and 6 should not be italicized. "Line 3 ... memory address EDI". It should be "Line 3 ... memory address ESI"
"R3 is the index multiplied by 2"
3 150 Text correction: Error in code listing under "IRP Handling"
It supports IRP_MJ_READ, IRP_MJ_WRITE, and IRP_MJ_DEVICE_CONTROL operations, and sub_10300 is the handler (renamed to IRP_ReadCloseDeviceIo).